This Sunday I was out for 6 great hours, and covered about 40 miles, at least 10 of them on gravel. I rode straight out 3rd St, and followed SR 46 all the way into Brown County with almost no cars to harass me. On Sunday morning, very few people are traveling away from Bloomington and there is about a foot and a half of asphalt to the right of the painted line, it allows cars to pass with out leaving their lane. Crooked Creek Road is a fast 14 miles from the Kirkwood gates, via the highway, and a few miles longer and slower when I take the half gravel “lowway”: Lampkins Ridge/Friendship/Kent/. I took Lower Schooner once I made it to TC Steele Road. There is some climbing, but nothing big, and it is just a tenth of a mile longer than the highway, plus few cars and a great view of Salt Creek, just as the road climbs the ridge. Crooked Creek starts out gravel, but I was able to climb the 265 feet up to the ridge, spitting stones backwards in a couple spots. I rode through the quiet forest ridgetop for a while, then came rumbling down into the valley, and stopped for a break at Crooked Creek Lake. The road is 5.4 miles long, and where it runs through Yellowwood Forest, the road is gravel, but where there are homes along the side of the road, the county does a good job of paving, I’d say less than 2 miles are paved, you leave and enter the forest several times. When I got to the boat ramp (where Crooked Creek becomes TC Steele Rd. ), I found a little road that crossed the creek, and looking down stream I spotted some canoes and a yak. I took a quick picture, and gazing the boats heading downstream, and thought to myself: “How many canoers have straight brown hair all the way down their back?” and answered my own question by hollering “Hey Brian”, and yep it was Brian Richwine. He mentioned that the “road” I had found winds its way around the hillsides all the way to Browning Hill and Elkinsville, and that he has made the journey. 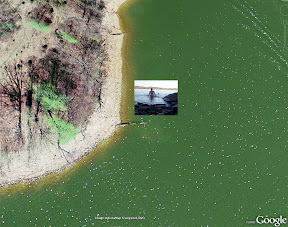 I’ve been wondering about this as I can see in Google Earth that there are parts of road all the way there, but the water in lake has to be below pool level (538 amsl), or many parts of the path are under water. I measured and it is about 6 miles to Elkinsville, I think I could do it in an hour, two at the max if I have to bushwhack. I want to climb Browning Hill while there, so this would be an all day trip out and back, I plan on riding TC Steele to the ramp, it is only 15 miles rather than the 20 via Crooked Creek, and is paved the whole way. It was a much shorter ride up TC Steele to Gilmore Ridge, and it was early afternoon, so I decided to take the long way home, via Gilmore Ridge and McGowen Rd. This is the steepest of hill that I’ve found, all gravel, and then it runs through the heart of the forest east of Pine Grove. This video give you an idea of how narrow, steep and rocky they hill is. The road then runs through the marsh flats along Salt Creek north of the lake. I got to explore this area twice this year (you aren’t allowed in October through May), and it is amazing, here are my pictures from the rides I took there, starting by going down Duke “Road” into the wildlife area. Nature Journal: The trees are still mostly green, a lot of yellow, but very little red or brown yet. I saw hawk (buteo) in the salt creek valley, and a really big pileated woodpecker on Crooked Creek, I recognized the call, and so stopped and scanned the trees till he/she flew to another tree, showing its characteristic black wings with a white underneath and red plumed head. This one was bigger than most crows, quite the specimen. The news it that Kerr Creek has been repaved, and is smooth…I can’t wait to try coming down. The Hilly Hundred comes but once a year, and we decided to ride part of the route as we did last year. This year we lasted longer on the route, riding about 20 miles with the pack. Jojo and I headed north through Cascades Park, then up Hillview to Old 37 and down Firehouse Hill. We saw a few riders heading back our way, but they did not have numbers, and were not in the tour. When we got to Sample Road, we were warmed up, and stopped to take off layers while watching hundreds of riders going by as they turned on to Old 37. We joined the group, and it seemed there were a lot of fast moving riders, constantly shouting out “On your left!” Sometimes they would shout it just as they were passing, sort of like those car drivers who wait till they are alongside you, then honk to scare you. I think these riders are either scared I will swerve (even though I ride straight, even uphill), or they just want acknowledgement for their superior riding skills, or perhaps they just like to shout. All three played together, but I think the last was when riders less than 6 feet apart would yell “Car Up”, one after the other, I guess it is just part of the pack culture, and is actually quite useful when not overdone. We turned on Andersen Road, and hammered on till Bean Blossom Rd, which is about a mile and quarter miles long, rising steeply at first, leveling out and climbing again, with 275 feet of rise in elevation. At the bottom, some people started walking right away, others sprinted up the steepest grade. I just chugged along as usual, saving my energy, and to my surprise, I had enough juice left to “sprint” at the end, actually passing another biker as others had passed me. We parked at the top, and hung with the happy crowd, then I went to the top of the hill and took this video of other folks cresting the ridge. I got tired of being around so many people, so we rode north on Forest Road for a while and found a picnic table, and ate some lunch. I had a route lined out through the woods to Low Gap Rd and then on Bear Creek Road, but we had already seen some of the hunters our this season, and decided maybe we could wait till hunting season is over, I’d love to try it after a good snow. We headed back towards the crowd, but as we came to the intersection, just about everyone was gone. The Forest Road is one of those special place, it takes some real work to get here from town, 15 miles plus a couple of tough climbs, but well worth it. To the north is the White River Valley, and to the south the ridges drain either to the Bean Blossom, or Bryant’s Creek. The air here always feels clean, with the smell of fresh pine, and at 850 to 900 feet, the breezes blow strong. The Main Forest Road ends on the west at Old 37, which runs the ridge for another mile or two, then heads down to the valley. As we just got going downhill, Sue Aquila came riding up, slowed down a bit to say hi, then took off like a shot, her training and equipment puts her at least 10 mph ahead of our normal pace, even down hill. I assume she enjoyed moving fast through the route without having to contend with the thousands people ahead, though my guess is she caught up. We stopped to listen to the bluegrass band at the lunch stop, but soon headed out to the second half of the day as we had already had lunch. We crossed 4 lane 37 with the help of the state police, this was something quite unexpected. We had to climb up Turkey Trot hill, then took Paragon Road, which runs along the floodplain at the foot of the Hoosier Hills. We turned south and headed up Salem Road, taking it up to Burma Road. We rode a short distance more with the crowd, but then took Dittamore south to Bottom Road, which is always comfortable to ride, and we cruised through the valley. We stopped at turn in the road, and laid down in the warm sun, we were both pretty tired, our rides have been a bit shorter most days, and often broken with a hike or swim. On this ride, we were definitely influenced by all the folks trying to go fast, and so we hammered more often than usual. We were there about 5 minute when Sue came by, amazingly she had ridden out to Ellettsville, then the 50 miles of the Hilly, then back to Bottom Road to ride another 30 miles to make 100 for the day! We hung out a bit more, then heard a combine off in the corner of the field harvesting soybeans, and headed our way, so we headed up the hill after checking out the Bean Blossom Creek, which is really down, maybe 2 feet deep at the most. We climbed our last hill to Kinser Pike, came back through Cascades, and even with a little nap we were tired by the time we peaked the hill on College. We headed home, and I had enough left to do some chores, but we ate early, and I hit the sheets by 10 pm. Nature Journal: Not much to report, there are few wildflowers left, and the leaves are just starting to turn, the yellows are coming on strong, but still the forest is mostly shades of green. We heard a bunch of woodpeckers, and we saw a hawk fly down the road in front of us. I was walking in Dunn Woods yesterday at lunch when I noticed a bunch crows and jays just cawing their heads off. Jays and crows are cousins, but don’t normally hang out together, let alone co-operate, so I figured there must be a predator hunting in the woods somewhere. I’ve seen both crows and jays harrass owls while out riding in the woods, but never together. I looked and looked, but saw only the jays and crows as they flew from tree to tree, vocalizing their displeasure with the situation. After a while they quieted down a bit, and I had to get back to the office. Just as I walked out of the woods and headed towards Sample Gates, I saw a hawk (not an owl) as it passed right over my head, flew over the gates, and down Kirkwood before turning south over Kilroy’s. I had felt that she/he was there, so it was a great pleasure to see him/her flying over town. I do wonder why the jays and crows did not bother them during nesting and fledging in the spring, I suppose having the 2 parents there kept the jays at a distance, I don’t know if Cooper’s hawks will attack crows, but they do eat jays. Being an amateur mycologist, when walking in the woods, I am always on the lookout for mushrooms. I can identify quite a few, and it is always fun to find one that it is new to me. I most often find them when walking in the woods at Griffy or the forests all around Bloomington, and often the deeper you go into the woods, the better the finds. Well, I’ve found that you really don’t have to go all the way to the Deem Wilderness to find something exceptional, I just had to look next door. 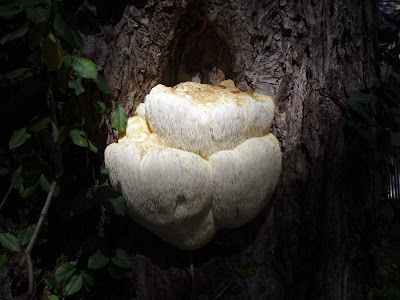 On the old damaged maple tree, I found a great specimen of the Lion’s Mane, Hericium erinaceus. 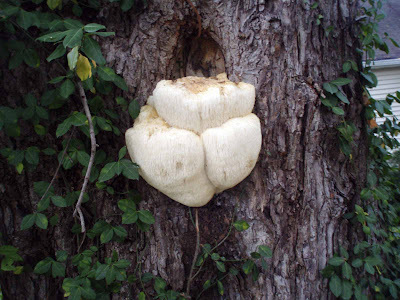 It is quite edible and highly prized in Chinese cuisine and traditional medicine. Recent studies have confirmed it has both anti-oxidant and lipid lowering properties compounds. Eileen had some fun activities at the Art Museum, so I headed out to Lake Monroe, a quick 10 miles to where I like go swimming. I geo-tagged the photos of the ride, but don’t believe it, I don’t want everyone to find this spot! When I got there there were boats all over the lake, it was busy for October, but then again it was over 80 degrees even in the late afternoon. As the lake has been at normal pool level for several weeks (538′ amsl), I knew our favorite tree trunk would be out of the water for diving. It’s been underwater for all summer, and was slippery as heck. WhenJojo and I were here during last year’s drought, the longest branch was dry and several feet above the water, but today, it was covered with slippery stuff, and about 6 inches out of the water, but that didn’t matter, and I dove time and again, marveling at how cool the water had become, even at the top. In midsummer, you have to dive a few feet down to find cool water, but it was all cool today, let’s say it was refreshing. I was a bit worried about the CO’s showing up, but that did not happen, the boats avoid the little point, they can see the log, and don’t want to get close. I don’t know why, but the water was much clearer than a few weeks ago, I could see several feet farther under water, and it was lighter farther down. I think because so little water has been coming in, that the suspended solids have had a chance to fall to the bottom and clarify the water. I finally got out and dried off, the air was still warm, though it was about 7pm and the sun was beginning to fall below the ridgetops. I rode back up the hill and didn’t break a sweat, and then the quick 10 miles home. It’s funny how long it seemed to get there, but I can barely remember riding back through the dusk, and yes I had my lights on. It will not be till next May that I will be swimming again, so now I am waiting for the lake to freeze so the ice riding can begin! There are several horses living along Harrell Rd, right where I stopped to look at the sunset. They saw me from across the field, and meandered in my direction, but horses are spooky, and even though I was talking nice to them, the kept their distance. Then I noticed how short the grass was in there field, and it was just as short for one horse’s neck length past the barbed wire fence. But for a foot or so along the road, the grass was long and green rather than short and brown. So I turned my back on the horses and started ripping up the long green grass, and when I turned around, all the horses were at the fence, ready to make friends. They no doubt heard me pulling the grass, and they could tell it was the good stuff, of this I am sure. I fed them all several handfuls, petted, patted and hugged the big creatures, then said goodbye, carrying their unique body odor in my memory. I went out of town north using Kinser Pike to Bottom Road. This route is used quite a bit, Bottom Road is long easy ride through the valley, no climbs all the way to its end at Mt. Tabor Rd. I stopped at Muscatatuck, but no birds were around, so I went on to Woodall Road, and took it around the Nature sanctuary, but the path was closed for repairs due to the flooding. I rode to the bottom of the ridge, where the Bean Blossom cuts along right to beginning of the rise. As the water was really low, I could see that there were a number of tires in the bottom, I was tempted to try pulling them out, but I had limited time, and then what would I do? Anyone with a truck who wants to help, let me know, there are a lot of tires in our steams. But then there is charge for disposal, and gas for a truck. Maybe the MCSWMD would want to help, I know they work on illegal dumping, which this is. The tires have nickel in them, and it leaches into the water, killing the fish. I followed Woodall to Delap Road, which runs more or less east/west. I followed it west to where it ends and Mt. Tabor and Stephens Road just north of Ellettsville. I took Stephen’s south past Bybee Stone and on into town, and more unfriendly bike town I’ve not seen in the is county. I got accross the highway, but got a little lost in the suburban style tracts, and had to ask someone for directions. I got to Tecumseh Drive, which ends at Thomas Rd, which I to Ratliff Rd., and from there went southeast along Woodyard Road back to town. Woodyard is not bad, but neither is good near where it intersects Vernal Pike. Cars travel fast both roads, but they are the best bet when on northwest side of the county.